The use of electronic monitoring is on the rise in America’s workplace. The number of companies that use some form of electronic monitoring has risen to 67.3% of employers. Total active monitoring of communications and performance has risen 10% in the last two years to include 45.1% of the nation’s employers, according to a 1999 American Management Association survey. Despite the negative effects on workers that often accompany the introduction of electronic monitoring, employers are using monitoring with more workers than ever before. Managers fail to realize that electronic monitoring is not able to replace the role of a supervisor. Electronic monitoring is likely to increase worker stress and decrease employee job satisfaction. Although electronic monitoring often does lead to increased productivity, this is frequently accompanied by a decrease in quality and customer service. Electronic monitoring is not the easy fix for management and production problems for which employers are looking. The majority of studies on the effects of electronic monitoring (EM) in the workplace find that monitoring frequently increases employee stress levels. A study headed by D. DiTecco, a Senior Consultant, of Management Sciences Consulting, Bell Canada, Montreal, entitled Operator Stress and Monitoring Practices reports the results of a survey of long distance and directory assistance operators in a large Canadian telecommunications company. All employees in this study had their calls monitored to measure the time it took to complete each call and the quality of the service. Fifty-five percent of all employees responded that some form of telephone monitoring added to the amount of stress they experienced with their job to a large or very large extent (DiTecco 31). Such a high level of employee stress will not only lead to employee job dissatisfaction, it can lead to stress induced physical problems. The effects of such a large percentage of employees experiencing stress as a result of monitoring can be observed in Employee Stress and Health Complaints in Jobs With and Without Electronic Performance Monitoring. This study by the Department of Industrial Engineering, University of Wisconsin-Madison surveyed 745 directory assistance operators, service representatives and clerical workers who represented AT&T and seven operating telephone companies representative of each region of the United States. The surveyed employees included monitored as well as non-monitored workers. Higher levels of stress in monitored employees resulted in an increase in somatic complaints including a 27% increase in occurrences of pain or stiffness in shoulders, a 23% increase in occurrences of neck pressure and a 21% increase in back pain experienced by employees. Other complaints among monitored employees included a rise in cases of extreme anxiety, severe fatigue or exhaustion, a loss of feeling in the finger/writs, shoulder soreness and depression(Smith 25). The stress associated with EM in these cases clearly has real world effects. The stress that employees experience may cost employers more on medical bills in the long run. Studies suggest that there may be many reasons for the increased stress that frequently accompanies electronic monitoring. In Electronic Performance Monitoring and Social Context: Impact on Productivity and Stress researchers John R. Aiello and Kathryn J. Kolb of Rutgers- The State University of New Jersey concluded that “monitoring induces stress in a manner that is not completely explained by objective changes in job design and loss of social support”(Aiello 1995, 349). In this laboratory study the jobs of monitored and non-monitored workers were outwardly the same, however Aiello and Kolb suggest that the perceptions of monitored workers concerning production demands and control could have increased their stress level. While both monitored and unmonitored workers were asked to work as quickly and accurately as possible, monitored workers may have perceived more pressure to perform at a higher rate in addition to experiencing increased feelings of evaluation(Aiello 1995, 349). These conclusions are consistent with studies that examine the effects of EM in real work situations. In addition to stressful effects that may be inherent in electronic monitoring, several case studies have examined job stress as a result of changes in job design. When an employer introduces EM, the way employees are evaluated often changes. Electronic monitoring technology allows employers to monitor the production output of their employees. Employers frequently set production standards in an attempt to encourage their employees to produce more in shorter amounts of time. A study by Rebecca Grant and Christopher Higgins shows that workers who do not find performance standards readily attainable are more likely to feel the stressful effects of electronic monitoring(Grant 106). Workers who do not meet performance standards are not necessary incompetent employees. Performance standards are often determined by the average work performance of all employees. If 50% of employees are not meeting the performance standard when it is set, it is not surprising that half of the employees in an office using EM would respond to it negatively(DiTecco 33). By definition, half of the employees subjected to performance standards that are set at the office average will be producing below the average. If production standards are constantly set at this level, many employees will never be able to reach them. Some industrial engineers set performance standards at a level that 90% of the work force is not currently meeting. A Navy Personnel Research and Development Center laboratory study by Delbert M. Nebeker and B. Charles Tatum shows the stressful effects of standards that are set at this level. Job satisfaction decreased and stress increased when employees were offered cash incentives to raise their performance over standards that only 10% of the work force was meeting(Nebeker 529). Performance standards often make quality employees feel negatively about their job. When employees receive negative feedback because they are not meeting performance standards, they are likely to find their jobs less fulfilling and more stressful. Another study by Nebeker and Tatum, which was also published within the same article, did not show that EM had a significant effect on stress in the workplace. The discrepancy between studies that report that EM has stressful effects, and those that do not, may be linked to the level of importance employees attribute to their jobs. Nebeker and Tatum’s study that did not report stressful effects hired “employees” to work for eight days, four hours a day. When performance standards were introduced the employees were told their purpose was to “(a) allow the workers to keep track of their individual performance, and (b) to allow the supervisors to monitor the overall work process and make any necessary adjustments”(Nebeker 516). The workers were never told that the performance standards would have any effect on their employment or on the level of their pay. Furthermore, because the “job” included only data entry, paid close to minimum wage, and lasted for a short period of time, it is not likely that workers were personally attached to their jobs to a great degree. While this setting provided only limited similarity to a real workplace setting, other laboratory studies are even less applicable to the real world. Monitoring and Performance: A Comparison of Computer and Supervisor Monitoring by Terri L. Griffith examined “employees” who completed a data entry task for less than four hours. Employees were monitored for a total of ten minutes split into two five-minute intervals. In addition subjects worked alone or with a supervisor, but never encountered other employees. The study employed women through a contract with a university sorority and through fliers posted around a university. The women were paid $15 for the time they worked. It is therefore not surprising that the study found no difference in job satisfaction between employees who were monitored and those who were not monitored. Although the employees were led to believe that the laboratory study was a real work environment, it is difficult to believe that these employees would respond to their jobs in the same way that full time employees would respond. Despite their lack of applicability to real work settings, the “employees” in these laboratory studies may have reported lower levels of stress because they expected their “job” to be boring, and primarily quantitative in nature. Grant and Higgins found that employees who expected their job to be boring and quota oriented were not bothered by the introduction of EM(Grant 105). Employees who expected the job to be simplified so that it could be monitored more easily were not bothered when exactly that happened. Employers who introduce EM seem then to be catering to the employees who care least about their work. These are then the same employees who are the least likely to stay with a company for long periods of time, devote more time to their work, and provide the highest quality work. The way data collected by EM is used by management can have a negative effect on an employee’s job satisfaction. When EM is introduced into a workplace, job design changes include a transition in the way an employee receives feedback on their work.. Depending upon the way feedback is handled, employees may conclude that their human supervisor has been replaced by an electronic supervisor. Electronic monitoring systems that not only collect data, but also assign work have evoked references to an Orwellian “Big Brother” style workplace(DeTienne 33). In Monitoring Service Workers via Computer: The Effect on Employees, Productivity, and Service Rebecca Grant and Christopher Higgins report that as the pervasiveness of the tasks that are being monitored increases, EM becomes less acceptable to employees. When work is assigned by a computer, or a computer evaluates work in progress, employees are likely to believe that the computer is functioning in a way that it can not handle as well as a human supervisor could(Grant 108). Managers who allow a computer to become an employee’s supervisor are taking an employee’s control over their work away. Employees who lose all control over their work are not likely to find their job satisfying. Grant and Higgins also report that when the data collected by EM systems are distributed to higher level managers, or are made public, its acceptability also plummets(Grant 108). This type of data reporting strips away employee privacy, the idea that every employee contributes to a group output, and willingness to aid other employees in their work . 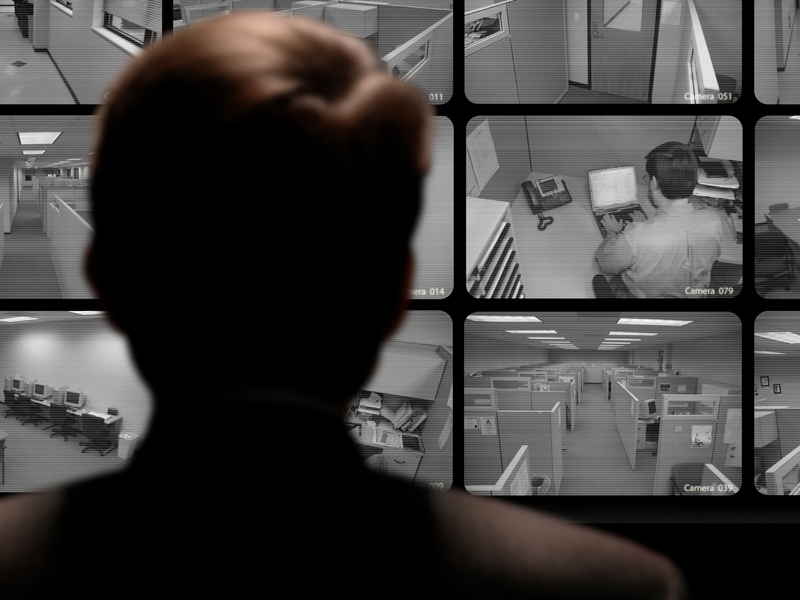 When employees are monitored in such a fashion it is not surprising that references to “Big Brother” are evoked. A Louisiana State University study Employee Reactions to Electronic Control Systems: The Role of Procedural Fairness, by Roland E. Kidwell, Jr. and Nathan Bennett, reports on the results of a study on the effects of feedback from EM on employees. The study concluded that public employees were more concerned with the level of fairness they received in evaluation than how fairly they were rewarded(Kidwell 210). Similarly, the employees that Grant and Higgins surveyed reported that although EM systems reported accurate data about their work, they did not always lead to a fair evaluation(Grant 105). It is difficult to find evaluations taken directly from EM systems that include evaluations of the “human” aspects of performance, including work ethic, motivation, and quality. Employers who introduce EM into the work place are likely to encourage their employees to favor quantity of work produced over the quality of work. Even employers who do not intend on placing production increases above quality in order of importance may do so inadvertently, simply because quality is more difficult to monitor electronically. Pressure to increase productivity commonly has adverse effects on the quality of work produced. In a study of 85 claims processors and clerical employees in three branches of a major insurance company Grant and Higgins found that “Monitored employees were less willing to pursue complex customer inquiries than their unmonitored coworkers and complained more of hostile or stressful work groups”(Grant 105). D. DiTecco’s survey of long distance and directory assistance telephone operators reported that 70% of monitored employees replied that they had difficulty in serving their customers well while maintaining production quotas and that this contributed to the stress they experienced to a large or very large extent(DiTecco 32). Monitored employees repeatedly report that they feel pressured to keep their productivity up while finding it difficult to maintain high levels of customer service. Grant and Higgins also conducted a broader study, which is also published in Monitoring Service Workers via Computer: The Effect on Employees, Productivity, and Service. The second field study reports the results of a survey of 1,500 employees in 50 Canadian service firms. Grant and Higgins were unable to determine the actual change in quality as a result of electronic monitoring, but they did discover some interesting results concerning employee perceptions of quality. Employees responded that as the number of tasks their employer monitored increased, employees increasingly believed that production was more important to their employer than quality. While this did not change the value of importance that employees placed on quality, the survey was unable to assess the effects of employer perceptions on the work of employees(Grant 109). Employees may reduce quality unintentionally in their attempt to live up to employer expectations. In one of the first field studies concerning the effects of EM on employees, R. H. Irving, C.A. Higgins, and F.R. Safayeni reported similar conclusions as to the perceived importance of quantity over quality to management. Participants in the study were employed at one of three insurance companies, a financial institution or a government regulatory agency. While two of the insurance companies used EM, the other agencies did not(Irving 795). Irving, Higgins, and Safayeni found that monitored employees reported that a much stronger emphasis was placed upon quantity of work that did employees who were not monitored. Workers in jobs that used EM also reported significantly more often that quality was under-emphasized in their jobs. Monitored employees also reported that more “human judgment” errors were made, reducing the quality of the work produced(Irving 798). The EM systems could find clerical errors, but were unable to do the job of a human supervisor where judgment errors were concerned. Columbia University Professor A.F. Westin published his study of an electronic monitoring system installed at one of Federal Express Corporation’s call centers in his article Two Key Factors That Belong in a Macroergonomic Analysis of Electronic Monitoring: Employee Perceptions of Fairness and The Climate of Organizational Trust or Distrust. After a performance quota was introduced in connection with the introduction of an EM system customer service representatives found it difficult to keep quality at a high level. Customer service representatives focused on completing calls within the 140 seconds that the production quota allowed above all else. Several examples were given in which customers were cut off or their questions were passed over in order to complete calls in the shortest amount of time possible. Employees reported that customers were beginning to complain that they were not being treated with the same quality of service that they were used to (Westin 40). Federal Express adjusted their monitoring system to place less importance on quantity and measured quality by asking customers to complete surveys after making a call. After the adjustments for quality measurement were made in the EM system, the average call time was brought down below the 140 seconds employees were originally allowed per call(Westin 41). Many companies do not have the same ability to monitor quality because of the nature of the type of work they are monitoring. It is much more difficult to electronically measure the quality of work in tasks that are not as simple or quantitative in nature as clerical work. Researchers do not all come to the same conclusions concerning quantity/quality tradeoff. Much of this discrepancy can be explained by differences in the type of work that employees completed in research studies of EM. In laboratory studies, which primarily measure the effects of EM by monitoring employees doing data entry tasks, there is less likelihood of a quantity/quality tradeoff. According to a theory of “social facilitation” when observed, or monitored electronically, the most frequent response to a task will be the dominant response. This means that when completing a simple task like data entry, where the dominant response is the correct response, it will be most common for an employee to enter the correct data(Griffith 550). While these studies may be applicable to the EM of data entry tasks, they can not speculate on the effects of EM when it is used with more complex tasks. Computer Monitoring of Work Performance: Extending the Social Facilitation Framework to Electronic Presence, by John R. Aiello and Carol M. Svec of Rutgers- The State University of New Jersey, examines the effects of electronic monitoring on quality and productivity when a complex task is performed by workers. In this laboratory study 72 female introductory psychology students attempted to unscramble 60 five letter rubbish words to form real five letter words. The participants were subjected to varying degrees of intensity of electronic monitoring. The results of the study found that participants who were not monitored were able to solve several more anagrams than workers subjected to any level of monitoring(Aiello 1993, 544). While with simple tasks social facilitation increases productivity, it appears to have the opposite effect when more complex tasks are monitored. Any type of customer contact can make a simple job more complicated and therefore the dominant response less likely to be correct. Although a few years ago primarily clerical workers were monitored electronically, today many different types of employees are monitored. According to the 1999 American Management Association survey Workplace Monitoring & Surveillance: Summary of Key Findings 21.4% of employers in the United States store and review the computer files of their employees. This percentage is up almost 8% in just two years(AMA 1). Not only are more employers monitoring the computer files of their employees, they are increasingly not just monitoring their clerical workers. The survey showed that 14.2% of employers store and review computer files of all of their employees as compared to 7.2% of employers who store and review computer files of selected categories of employees(AMA 3). Even more employers are storing and reviewing the e-mail messages of employees. In 1999 27% of employers reported that they stored and reviewed e-mail messages as compared to 14.9% of employers who employed the same practice in 1997. While 27.7% of employers store and read the e-mail of all of their employees, only 5.3% of employers read and store the e-mail of employees in specific categories(AMA 3). Electronic monitoring is no longer being used exclusively in jobs that require only simple tasks or those that can be easily simplified. Unfortunately, with the exception of the laboratory study by John R. Aiello and Carol M. Svec on the monitoring of complex tasks, there is virtually no research on the effects of monitoring on employees assigned work that is more complicated than data entry work. If EM increases stress and can have negative effects on relatively simple jobs, it’s effect on workers performing complex tasks should be just as awful if not significantly worse. E-mail and the internet may become less of a powerful tool for business if employees are forced to consider how their employer will react to every word they type. A survey by The Center for Democracy and Technology found that of 596 internet users surveyed, 178 reported that they avoided browsing the internet at work because they were concerned about their privacy(Privacy 1). Further research needs to be done in this area now that electronic monitoring is expanding into more and more areas in the workplace. Aiello, John R. and Carol M. Svec. “Computer Monitoring of Work Performance: Extending the Social Facilitation Framework to Electronic Presence.” Journal of Applied Social Psychology 23(7) (April 1993) pp. 537-548. “1999 AMA Survey, Workplace Monitoring and Surveillance: Summary of Key Findings.” New York: American Management Association, 1999. Grant, Rebecca and Christopher Higgins. “Monitoring Service Workers via Computer: The Effect on Employees, Productivity, and Service.” National Productivity Review Vol. 8(2) (Spring 1989). Griffith, Terri L. “Monitoring and Performance: A Comparison of Computer and Supervisor Monitoring.” Journal of Applied Social Psychology Vol. 23 no. 7 pp. 549-572. Irving, R.H., C. A. Higgins, and F.R. Safayeni. “Computerized Performance Monitoring Systems: Use and Abuse.” Communications of the ACM 29(8) (August 1986) pp. 794-801. Kidwell, Roland E., Jr., Nathan Bennett. “Employee Reactions to Electronic Control Systems: The Role of Procedural Fairness.” Group & Organizational Management, Vol. 19, No. 2, (June 1994) pp. 203-218. “Privacy Survey.” Online Posting. The Center for Democracy and Technology, www. cdt.org/privacy/survey/findings. July 1999. “Electronic Performance Monitoring and Job Stress in Telecommunications Jobs” University of Wisconsin-Madison, Department of Industrial Engineering and the Communications Workers of America. October 5, 1990.